“Keep it clean,” says the advisory at the top of Trash Talk the TTC. “Harassment or discrimination is not tolerated.” Well, good. That’s an important policy to have. But we shall see how long a public message board called “Trash Talk the TTC” actually remains a locus of civil discussion. Perhaps this is naive? Browsing the currently empty forums before they are swarmed with actual commenters is like wandering through some perfectly-planned Neighbourhood of Tomorrow before the residents actually move in and the idealistic premise of the exercise crashes up against the less auspicious realities of human behaviour. On the other hand, if the site does have the masochistic moderator that it needs, then it may very well become a valuable resource for those looking to improve the customer experience. Either way, it looks like Brad Ross now has a new web page on which to spend his days constantly hitting reload. I’m sure that nothing but good can come of this. Greg- I hope you’re being sarcastic. ” What could go wrong?” is surely not what you mean. This is not going to end well, at all. I tried to contribute usefully and already ran into an idiot who can’t do basic math. When will people listen to Joe’s wisdom?!! “What could go wrong?” is precisely what I meant. Does anyone else see the irony of posting a comment that basically claims nobody should read or accept comments, lest some odd or “extreme” ideas get through? On the larger subject, I looked at one of the posts Mr. van Egmond commented on, and noticed that it illustrated pretty well the overall problem with a board such as the one under discussion: it treats the TTC as an isolated entity, and thus invites us to make decisions in a vacuum. For example, the current fixed fare per trip arrangement the TTC uses creates a perverse incentive to avoid the TTC for short trips. If you have a car, going one or two subway stops has a marginal cost of pennies, while the TTC will set you back over two dollars, both ways. But that leads to more congestion, which slows everyone, including transit riders, down. But a focus merely on the TTC doesn’t address this problem, because it doesn’t address the overall ways we move around the city. I’m inclined to agree. I think the proponents of this service should consider the solutions emphasis of TransitCamp from two years, or metronauts of last year. As it is, we have an outlet for bad attitude and slander. I tried posting a few replies… it seems the forums are now moderated? 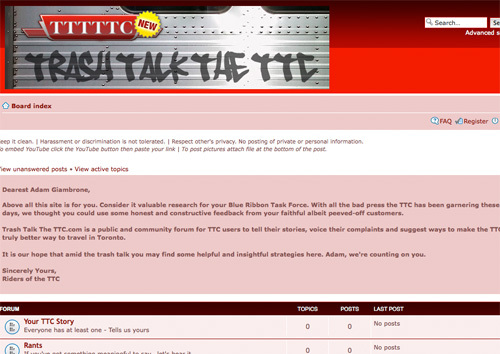 TTTTTC is definitely moderated. SPAM has to be prevented primarily, People who overpost may need to be asked to calm down, trolls may need to be banned, that sort of thing. I was trying to be funny, but with a point. The article I cited argued that a forum, especially one like this TTTTTC, needs a moderator who’s willing to pay attention and throw their weight around in order to keep things civil and useful. I’m pleased Loerchner is making his presence felt.